Breathable knit will not retain heat, stretches medially and laterally, and does not restrict mobility. Two spiral stays on each side offer stability and keep the knee support from rolling or bunching. Medial adjustable correcting strap helps to protect the knee cap. Anatomically formed viscoelastic pad with corrective tensioning counteracts patella misalignment and supports proprioception, heightening sensory awareness in the knee for increased joint stabilization. Combination of the wedge-shaped pad and viscoelastic pad produces intermittent compression on soft tissues for less swelling and faster healing. Soft neoprene material keeps your knees warm, lubricating your joints and preventing injuries. Workout with a peace of mind. Whether you enjoy hiking, running, playing sports, cycling, etc. or are recovering from a knee surgery, this brace has been designed with you in mind. Freely move around and do all of the things you love! 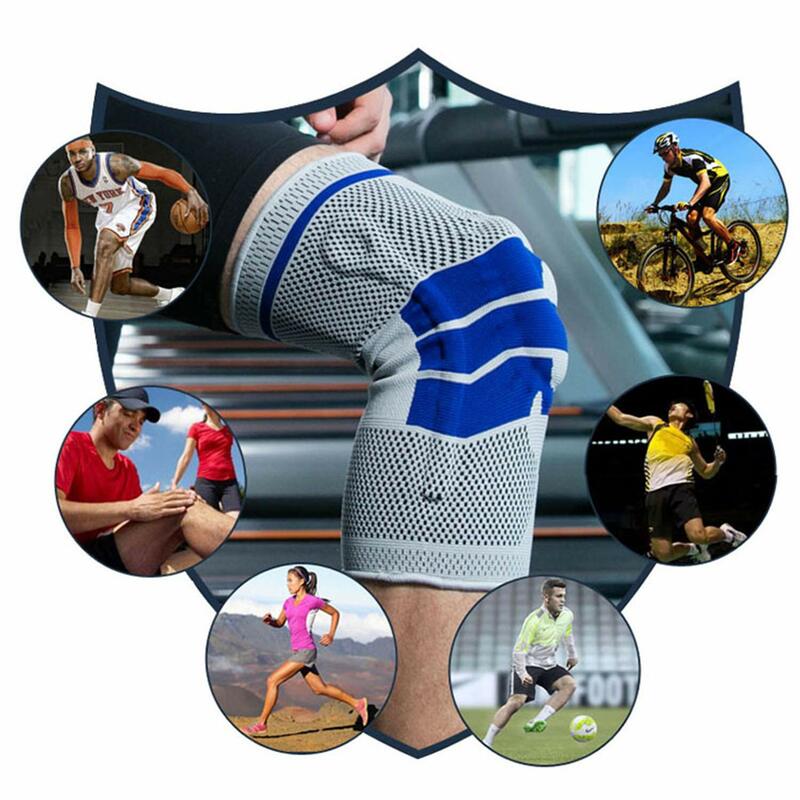 Advanced Pain Relief: Comprehensively reaches the joint space of the knee and alleviates pain in the meniscus. Optimal Compression: The knit design of the brace comfortably compresses the soft tissue of the knee and massages it while you move. It reduces pain and encourages access fluid to drain. Heating Effect: 3D braiding technology keeps your knee warm and at body temperature, as this reduces stiffness.The heating effect supports pain relief. Anti-slip Silicone: Anatomically shaped and sits perfectly without slipping or rolling down, keeping you comfortable,all day! Made With Breathable Materials: Smooth elastic edges and an extra-soft area at the back of the knee to ensure optimal wearability.